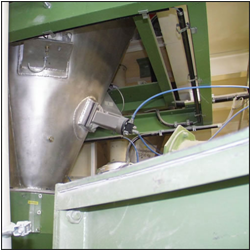 A customer in the chemical manufacturing industry, working with a 400-liter stainless steel hopper containing a fine bulk solid powder, faced significant challenges with flow, which led to inefficient emptying of the container. Build-up that included bridging, ratholing and material sticking to the interior sides was a constant problem, resulting in potential undesirable mixing between products and batches. Manual methods that included striking the sides of the hopper with a mallet were ineffective and increased the risk of injury to workers, as well as damage to the equipment. To solve the problem, the customer installed a MARTIN® PKL® Interval Impactor and a sequence control system to the hopper. During the emptying process, the PKL impactor delivers three strokes to the hopper, improving flow, emptying it thoroughly and allowing it to be filled with a new product. To keep the material from bridging on an ongoing basis, the sequence control system is set to trigger the impactor so that it delivers continuous strokes to the hopper for five seconds at five-minute intervals. As a result of the case_study of our products, the customer was successful in optimizing flow and preventing bridging within the hopper. This eliminated the possibility of undesirable mixing between products and batches, while enhancing overall efficiency and worker safety.